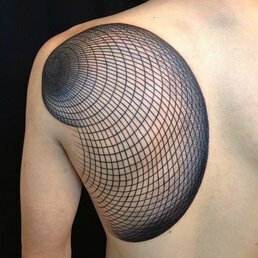 geometric tattooing, discussion question and thoughts. Geometric tattoos and “mandalas”, while they’re in resurgence in every part of the globe right now among modern tattooers, are a very old way of marking the body. Given new technologies, they’re different than traditional geometric work, but do they follow that same tradition? Is this really a trend within tattooing, or has it been there since the beginning? Do you think we will see more of this in the years to come, or will it peter out (like westernized tribal work has petered out a bit)? These geometric designs aren’t limited to one region, race, or culture- from the far north of europe and the arctic circle all the way around the globe, equatorial and islands, jungles and deserts- straight down to the southern tips of Africa and the Americas, these sort of designs are found everywhere. Most modern interpretations draw on multiple sources, new and old, and don’t snag directly from any one tradition, don’t appropriate meaning the way some westernized tribal art did. (Although there are exceptions as always). Almost every person can look back to their own heritage and find base images to begin working from- or they can use modern maths to create something entirely new, that fits within this style. I’ve been planning a few art brut tattoos lately, using this sort of layout for the body forms, and have done my share of geometry and radial symmetry tattoos as well. I’m wondering what everyone thinks of this little surge in demand for these. Also here are some amazing images culled from various sources, of tattooing in this style. Feel free to add your own images or thoughts in the comments. 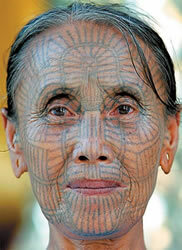 Kalinga tribal tattoo artist Whang-Od. Photo via Lars Krutak.